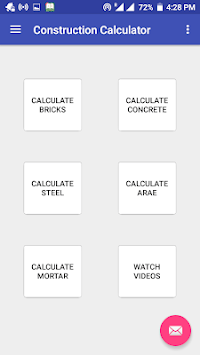 Bathroom tiles calculator for calculation of total tiles requirement for both walls and floor. Easy to use and a user friendly. No construction knowledge required to use app. Calculate slap, stairs, Beam, Column, walls, floor and plaster etc. 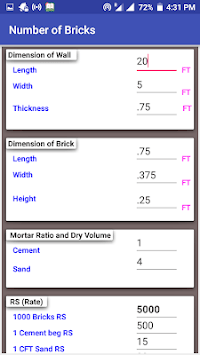 • you can edit Bricks Mortar ratio according to you. 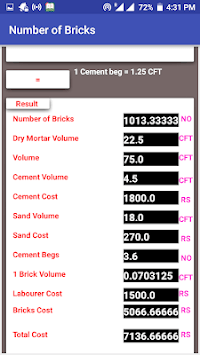 • you can edit Concrete dry volume according to you. • you can edid Concrete ratio according to you. • you can edit labour per CFT or per cubic meter rate according to you. • you can edit Cement bag rate according to you. • you can edid Sand or Aggregate per CFT or per cubic meter rate according to you. • you can edid Steel kg weight rate, steel lb rate, steel ton rate according to you.